One hundred children at south London football club Broomwood FC were paid a visit by top coach Hope Powell, to mark a new partnership between the club and Football Action. 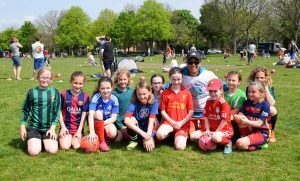 Hope, who is an Ambassador of the sport and education charity Football Action, delivered high-energy training sessions with four groups of children at the Broomwood FC finals day on Wandsworth Common in May. Money raised on the day and at Broomwood FC’s end of season gala will go towards Football Action’s project in Guatemala which gives girls who have been victims of sexual trafficking the opportunity to play football. Former England Women’s Manager Hope said: “It was great to coach such an enthusiastic bunch of kids. It’s really encouraging that grass roots football is thriving in South London – and the amount of girls that are taking part is fantastic. Hope Powell managed the England women’s side for 15 years and has recently become the first female coach educator at the Professional Footballers’ Association. She is patron of the ‘Kick it Out’ campaign and the Women’s Sport Foundation.